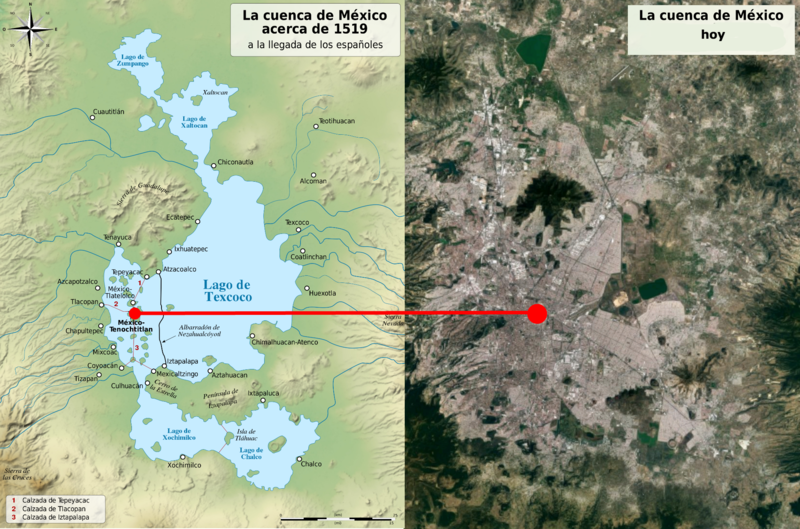 Then and Now: The relative location of Tenochtitlan within the Valley of Mexico in the 16th century and today. Tenochtitlan, the great capital of the indigenous Mexihcah people was, at its zenith, one of the largest cities in the world. Today, it’s the site of Mexico City and is still one of the world’s largest cities. Layers upon layers of history are buried beneath the modern city. After Cortés’ siege and destruction of Tenochtitlan in 1521, the Spaniards rebuilt and redesigned the city in typical European colonial fashion. Tenochtitlan was built on an island in the middle of Lake Texcoco (Nahuatl: Atezcatl Tetzcohco) and was connected to the mainland by a series of man-made causeways. The Nahua also constructed a dike across the lake to separate the lake into freshwater and saltwater zones, with Tenochtitlan falling on the freshwater side of the dike. As part of their siege, the Spanish conquistadors destroyed the dike. Consequently, the fertile areas around Tenochtitlan became salty and were no longer agriculturally productive. Seeing no value in the lake, the new Spanish rulers of Mexico City decided to drain it in 1607, working against nature and geography in the name of flood control and expanding the city. Draining the lake has caused many issues. Historically, much of the rainfall in the Valley of Mexico (Nahuatl: Anahuac “close to water”) was a result of evaporation from the lake. Now that there is little surface water remaining, Mexico City has become semi-arid. To quench the population’s thirst, the natural aquifers beneath the city have been over-drafted, causing the entire city to sink about 10 meters in elevation over the last century. The iconic axolotl or “Mexican walking fish” once thrived in the waters of the Valley of Mexico, and were so plentiful that they were a staple of the Mexihcah diet. Today, they are on the brink of extinction as their native habitat has all but disappeared. 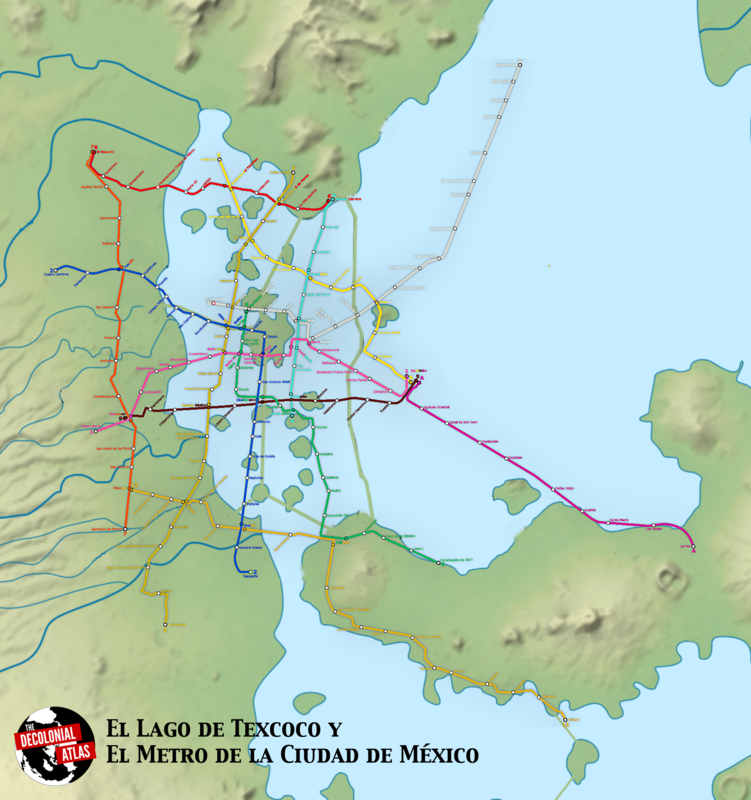 This map superimposes the modern Mexico City metro system on a map of region as it was in the 16th century, with Lake Texcoco dominating the map. Despite the efforts of the Spanish, vestiges of Mexico City’s precolonial history remain. The map shows how Line 2 (the blue line) follows the path of the ancient Mexihcah causeways quite closely. It runs North following the route of the old causeway from Coyoacan to Tenochtitlan, and at the Templo Mayor (Nahuatl: Hueyi Teocalli), the symbolic center of Mexihcah civilization, it turns west to follow the causeway from Tenochtitlan to Tlacopan (modern neighborhood of Tacuba) on the mainland. With the exception of newer Lines A and B (purple and grey), most of the metro system is west of the Dike of Nezahualcoyotl in the freshwater part of the lake. Line 8 and 12 (green and gold) follow the shore of the Iztapalapa Peninsula. The metro system’s construction has resulted in more that 20,000 archeological findings. This map was made by Jordan Engel. It can be reused under the Decolonial Media License 0.1. Next Where Does the Water Go?